Fascinating nonfiction, conversationally written and well-paced with a near-thriller feel, with some twists and surprises along the way. The Man In The Rockefeller Suit vividly portrays how even the most intelligent and accomplished among us can be easily duped by a skilled con man, adept at hiding his lies and deceit (and worse) behind an audacious facade of charm, wealth, and privilege. 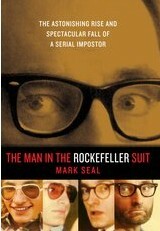 The Man In The Rockefeller Suit is highly recommended, and available at Amazon here.